1. In a large non-stick skillet over medium-high heat, soften the onion, garlic and mushrooms in the oil. Add the bell peppers and continue cooking for about 5 minutes. Add the remaining ingredients. Mix thoroughly. Bring to a boil and simmer for about 10 minutes or until the chili has thickened. Season with salt and pepper. 1. In a bowl, combine the avocado, bell pepper, basil and lime juice. Season with salt and pepper. 2. 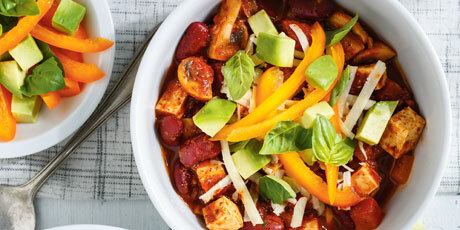 Spoon the chili into bowls. Top with the avocado salad and cheese.